→ Article: Not About Conformation And "out Behind" Nope! Not About Conformation And "out Behind" Nope! In my experience to see if a horse is 'out behind' you will draw a line from the outer point of rump (I hope thats what you call it) down to the ground and the hock WHEN THE HORSE IS SQUARE should fall inside or at this line. So many people are drawing this line with the horse camped out from posing or other odd stances or even while in movement and while I can 'sometimes' see what they are getting at most of the time I just don't see it on the horse in question unless its stood square. Once stood square sometimes the horse ends up with this trait, other times not at all. Also be careful its not just the way the angle of the photo or the stance is Actual lines or ways of how you figured it out would be really nice!! 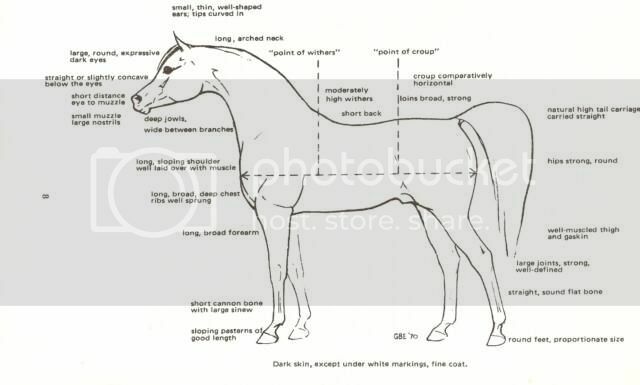 Also remember the arabian breed standard asks for a certain type of tail carriage and not a low set tail.